Around 11 in the evening the boat docks in the port of Alat, Kazakhstan. After an hour at the border control, filling in some papers, we cycle out of the harbor. Together with some other cyclists we are looking for a place to camp. Not far away we see a restaurant with a parking lot. After a short talk with the owners we can set-up our tents there. We quickly put up our tent and go into the restaurant for a Kazakh beer. In the end all the cyclist we met on the ferry join and it’s starting to get late! To think that, we have to get up early tomorrow and start cycling in the desert heat. The next morning we hurry to get to the city, about five kilometers away. 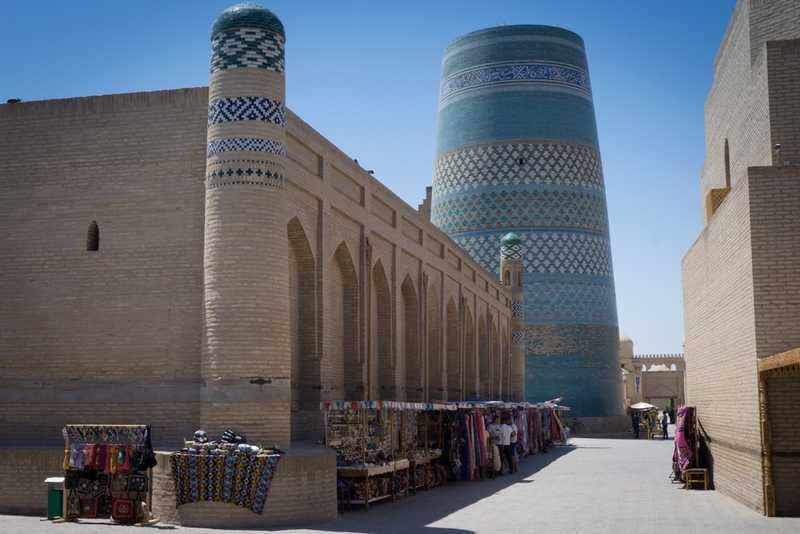 Quickly we withdraw some Kazakh money and buy food for the coming days. Without really knowing what to expect we cycle out of town. The first part is going well and we said to each other, this is actually quite easy! We had not taken into account that we still need to find some kind of shelter for the lunch break. Suddenly it becomes very hot. I feel the bottom of my slippers and they feel like they have melted. Lynn can not stay in my wheel anymore and we go slower and slower. I start to worry. In the distance I see a group of camels behind a electricity pole. That’s not really hopeful. Lynn sees a bridge on the map. I doubt it and for miles I don’t see anything that looks like a bridge. Suddenly we see a tunnel under the road and that is our rescue. We lay inside the tunnel and it feels like hell on earth. The wind blows and we get sand-blasted. My thermometer indicates 40 degrees celsius inside the tunnel, it feels like an oven. We have to stay here for at least five hours. When it’s about 6 o’clock it’s still 38 degrees celsius inside the tunnel and we decide to move on. On to the next village. Once on the bicycle it’s a lot better, because the sun is not as bright as in the afternoon. Just before sunset we arrive in the village and we can set up our tent behind a small supermarket. It is also hot at night. We wake up multiple times, sweating. When the temperature finally starts to become comfortable, our alarm clock goes off. It’s 4 o’clock in the morning and our plan is to cycle 80 kilometer before it gets too hot. Early in the morning it is easy to do, but the short night made us very tired and we have difficulties keeping our eyes open. Even while cycling. Finally we arrive after 80 kilometers in the next village. We can’t find a place in the shade to wait for the afternoon. We cycle through all streets and when we almost give up hope we see an oasis with trees and even a little patch of grass. However there’s a fence around it, and a building inside. Carefully we go inside and sit on one of the benches. Soon some old men come out of the buildling and they invite us for a tea! It turns out to be some sort of day care for the elderly. We can roll out our mats in the garden. Unfortunately, here too it is very hot and we are attacked by flies.. Then we wondered, why are we doing this? Let’s take a train.. The train arrives at the only platform. As we have to board the train with all our stuff, before it leaves again, we are stressed. We ask every conductor but no one wants to help us. When we arrive at the last wagon, the conductor says that the bikes are not allowed inside the train. What now?! We decide to just load them up ourselves. First all 12 bags and then the bikes. The conductor is right, it really doesn’t fit. The bags block the narrow footpath of the overcrowded train and no one can enter or leave the wagon because of the bicycles that block the hallway. I try to put the bikes on the rear wheel. The conductor is very angry and is yelling things I can not understand. A moment later he gestured that the bikes should be moved to another place. I’m going with him with one of the bikes. He opens a special door, where there is enough room for the bikes. The conductor is still angry and when he grabs the bikes, he literally throws them in the corner. I decide to not say anything and be happy for being able to take our bicycles.. The train consists of bunk beds where you can not really sit or lie down comfortably. The whole train is full, except the places where we are sent. When we sit down we understand why… it smells like there is a dead animal under our beds. We also can not open the windows in this cabin. When I lie down I sweat so badly that sometimes I have to sit up straight again to cool down. When we arrive in the morning we go to a hotel with air-conditioning. We turn the temperature down to 16 degrees celsius and for two days we do not leave our room, except to eat 😉 . 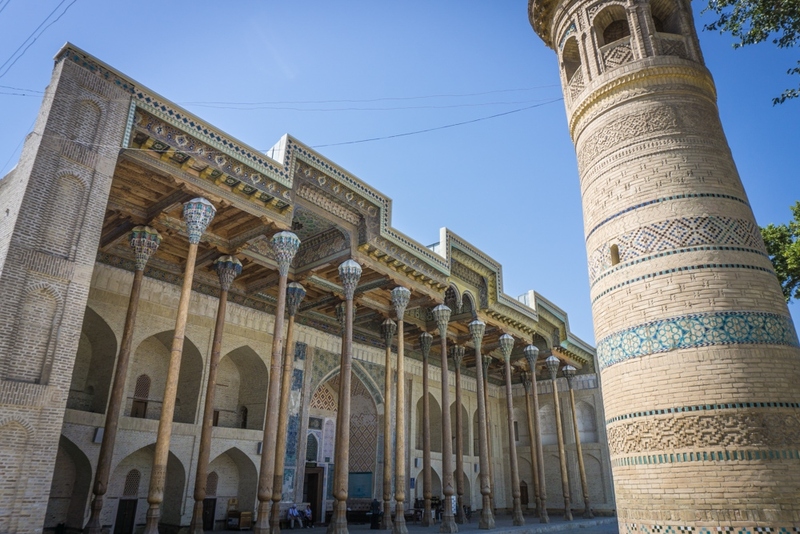 From Beyneu, the last village before the border, we take a train to Nukus in Uzbekistan. 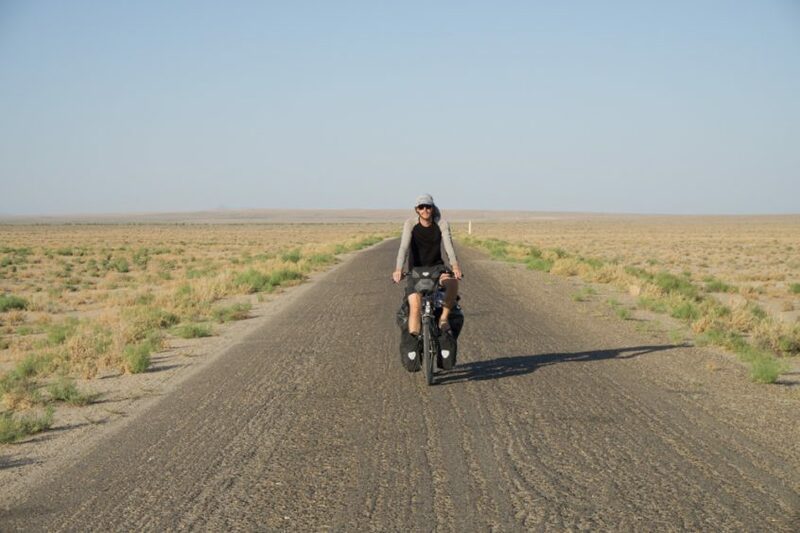 A stretch of desert of more than 600 kilometers. This time we have a cabin where the window can open, but we still suffer in the heat for 16 hours. That’s why we decide to not to take any trains again and cycle the last kilometers through the desert. In the desert the çayhanas, tea houses, along the road are ideal for us. There is water, often a small shop and there are little platforms with pillows where you can sleep. We start cycling around 5 o’clock in the morning and until 11, then we make dinner inside the çayhana, order some drinks and try to get some sleep. About every hour we wet our shirts to cool down. At 6 o’clock we get back on the bike and cycle until sunset. Then we put up our tent in a hole, or behind a sand dune, to make sure we are out of sight. 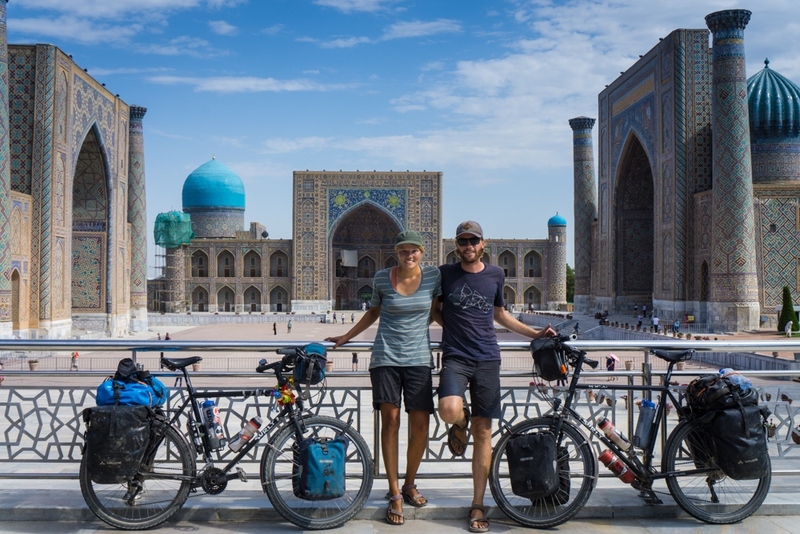 We do this for about 1,000 kilometers, with three stops in the cities of Khiva, Bukhara and Samarkand. The day before we arrive in the city, we camp another night close to the city. 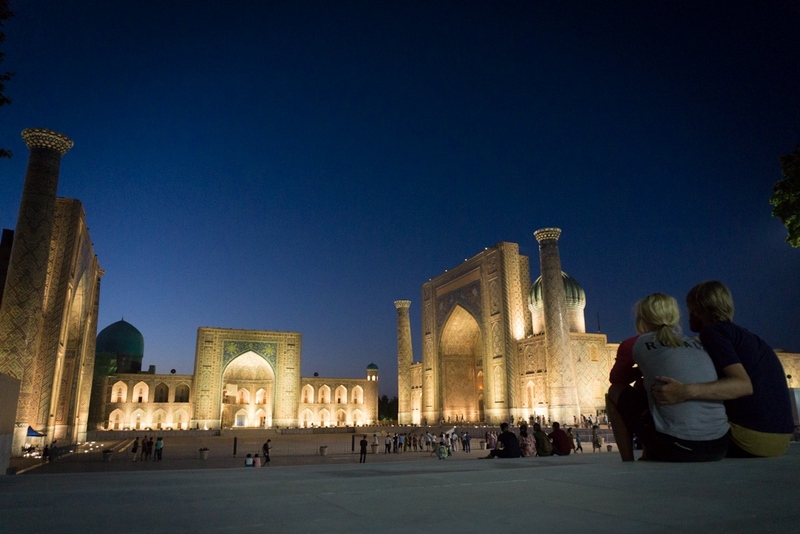 This way we can fully enjoy our room (in Uzbekistan they don’t have check-in times) 😉 . All cities have a beautiful old town, which reminded us a bit of the cities in Iran. 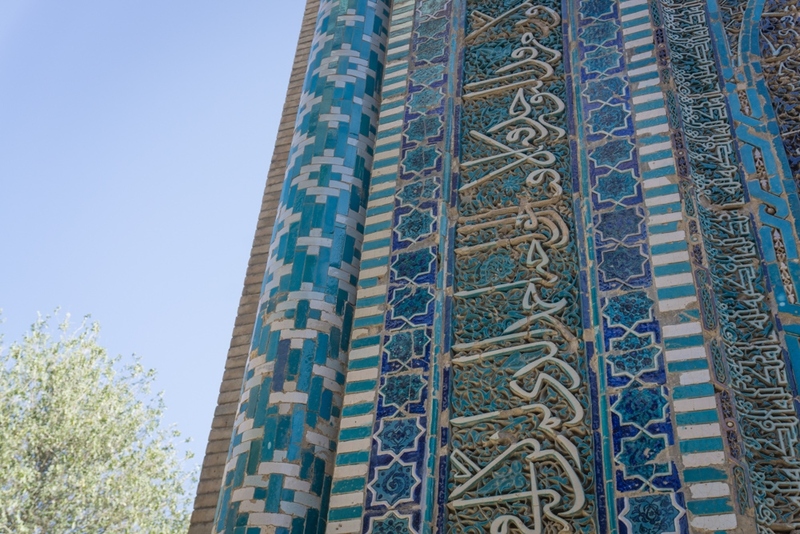 But a bit more aimed to tourists.. It’s definitely worth a visit and especially the beautiful square of Samarkand was a highlight!